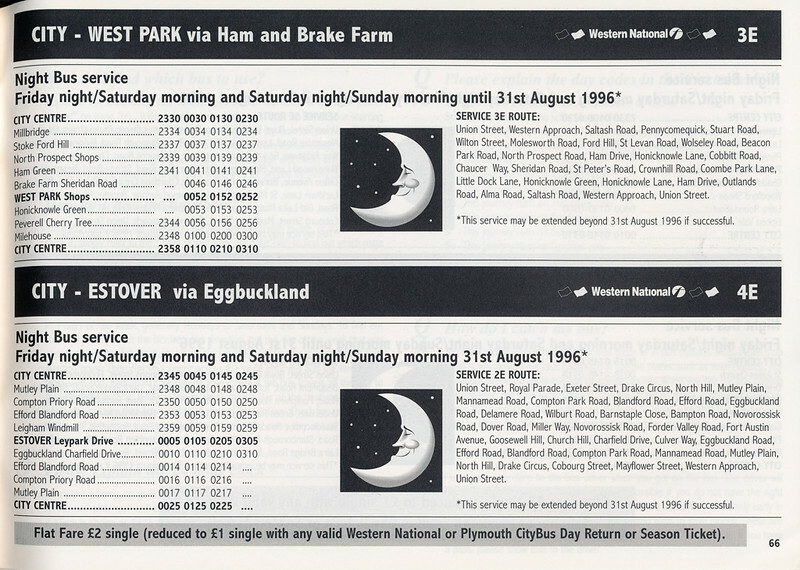 Western National operated a small network of night buses as long ago as 1996! 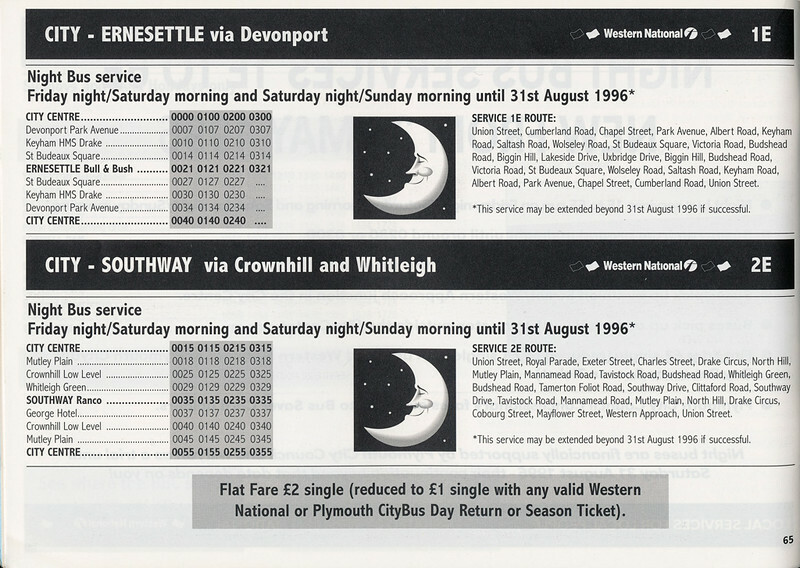 Interestingly the single fare was £2 which is exactly the same as it will be in January 2013 some seventeen years later! Thanks to Nick Aldous for supplying the scans - ands this was before we knew Night buses were on the agneda again - great timing! Goes back further than that Graham. Dances in the Guildhall on a Saturday in the late 50s and early 60s had late night buses. Not too many routes so the journey would often be decided who had bought a ticket and where they wanted to go ! I remember using Western National's night buses they were quite well used and I don't recall any trouble the times I used them. They used to leave from Union Street outside Sparrows and were run under contract from Plymouth City Council. A lot of people though at the time weren't aware that the services ran or where they went to. I think if they were to be resurrected then they would need to be aggressively marketed to the public. 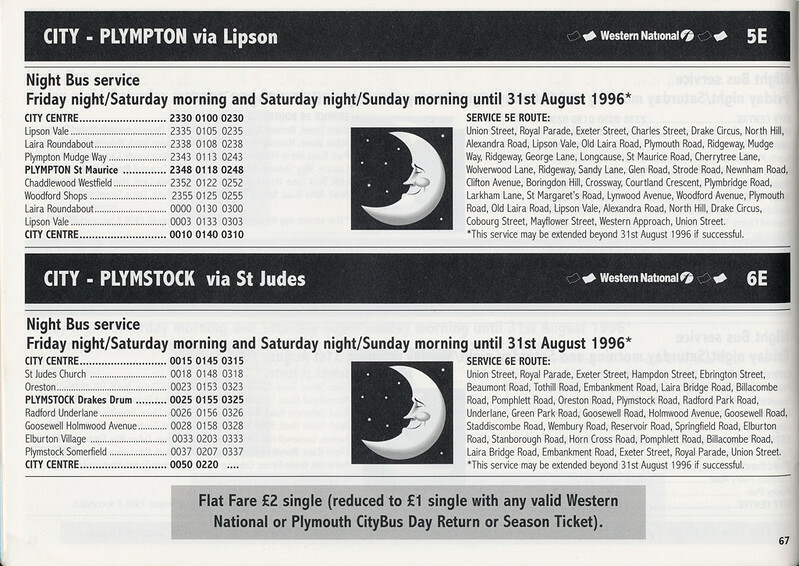 I can't though remember when these services stopped. I think they ran for a good few years and may have been reduced in number at sometime - did they end up as only 3 routes? 11E, 12E and 13E? rather than use E why not use N like london? 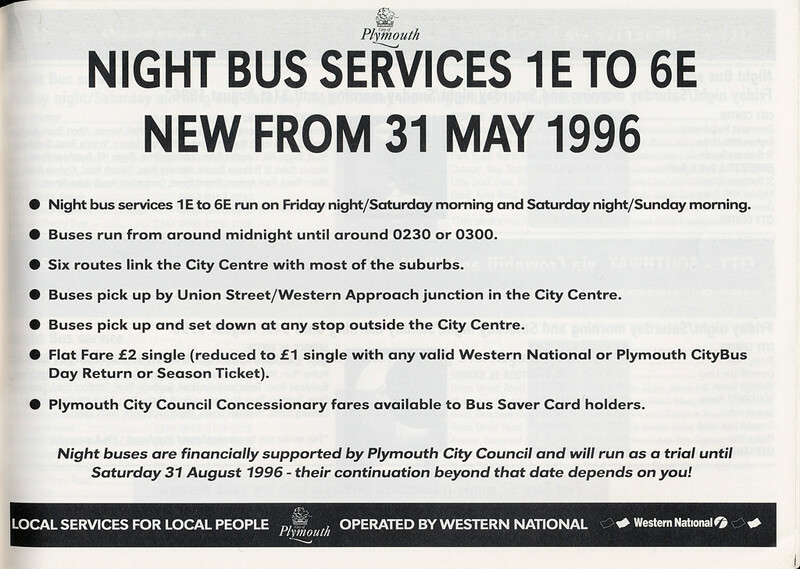 Talking of other Go-Ahead companies, here on the Isle of Wight we have run night buses on Fridays and Saturdays since 1986 and they have always been successful. New Years Eve is one of our busiest nights of the year and needs duplication. We also run a full Sunday service on Boxing Day and it is our busiest Sunday operation of the winter period, beating any of the Sundays leading up to Christmas (and we generally run good frequencies on Sundays) so there is no reason why a city like Plymouth should not thrive with buses at holiday times. Even our Christmas Day routes are popular, if not hugely profitable. It is good to see improvements in evening and Sunday services in Plymouth as I believe that is the way to grow more business.